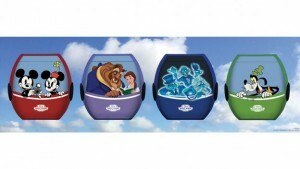 The Disney Skyliner transportation system was announced this summer at the D23 Expo and Disney recently gave guests an update about the new gondola system. The Skyliner “cabins” will feature Disney characters including Mickey and Minnie, Belle and Beast, the Hitchhiking Ghosts, and more. The Skyliner will have stations at Epcot’s International Gateway, Disney’s Caribbean Beach Resort, Disney’s Pop Century and Art of Animation Resorts (shared), and Disney’s Hollywood Studios. The station at Epcot will be in the same style as the European buildings near the International Gateway and guests will get a “birds-eye view” of World Showcase. Disney’s Caribbean Beach Resort will be a hub for the Skyliner and the station will resemble the Caribbean-style buildings of the resort. This station will allow guests to transfer their gondola route also. The station at Art of Animation and Pop will be shared by the two resorts, offering guests a view of Hourglass Lake. No opening date has been announced yet for the Disney Skyliner system.